ABOVE: The Hotel San Sebastiano Garden is on a canal near the San Basilio cruise pier. INSET BELOW: The hotel's entrance and garden. Location: A five-minute walk (at most) from the San Basilio cruise terminal. Closest Alilaguna Airport Boat stop: Zattere. The Hotel San Sebastiano Garden is also convenient to public transportation: It's only a couple of short blocks from the San Basilio vaporetto stop, where you can catch a No. 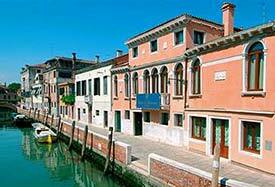 2 water bus to the Piazza San Marco, the Piazzale Roma, or the Santa Lucia railroad station. And if you don't mind walking a moderate distance along the Zattere, the wide pedestrian promenade that runs along the Giudecca Canal, you can easily get to or from the Zattere airport-boat landing. The first image shows the San Basilio pier on the left. Just to the right of the terminal, a small footbridge leads to a vaporetto station (the platform that's connected by a walkway to the pedestrian promenade). To reach the Hotel San Sebastiano Garden, turn left into the street opposite the vaporetto station, cross the square at the end of the street, and walk a few meters along the canal to the hotel. In the second photo, you can see the Hotel San Sebastiano Garden across from the church that Google has incorrectly labeled "Università Ca Foscari Di Venezia." The hotel is right behind the word "San" in "Fondamenta San Sebastian."